Whilst cluttering up the grid, we happened across one of our favourite GT drivers, Joe Osborne. 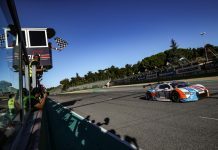 It turns out that a 24-hour race as well as being a great event to participate in is also an excellent opportunity for drivers to improve their racecraft and practice their arts. 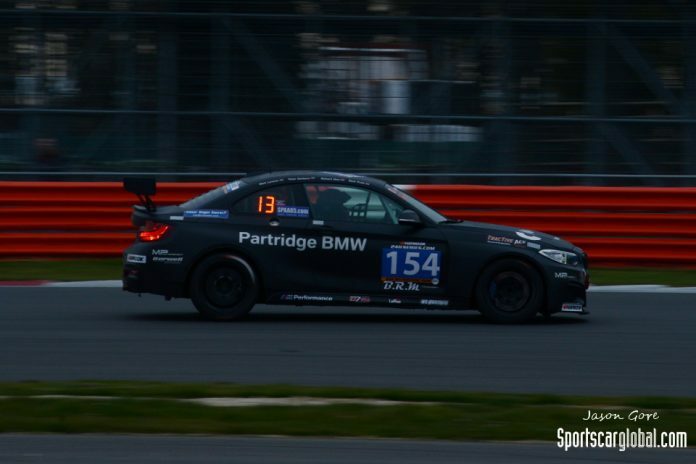 Strangely though Joe is not on the driver roster of the #154 Cup1-Class BMW M235i Racing Cup car, Joe has been given the helm as team manager… What could possibly go wrong! SCG – Sorry to find you in the garage, and under these circumstances, how difficult is it out there? ML – It is probably about as horrific as it can get, it is very dark, very wet, and on top of that a car blew-up its gearbox and spilt oil from the exit of Stowe to the entrance to Farm! That area has stayed treacherous ever since. SCG – How do you set the lighting rig up to help in these conditions? 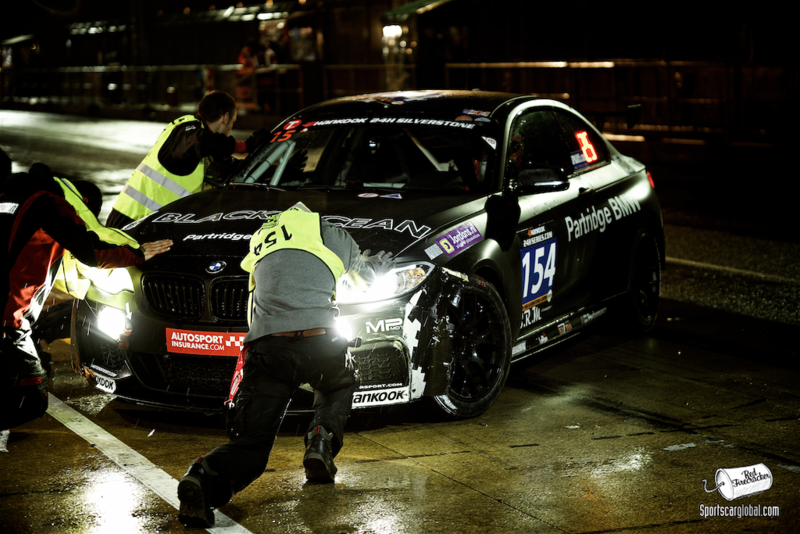 ML – Well the lights are not brilliant on our car, but you set them up to pick out the apexes, and long beam lights to help identify potential hazards as early as possible. So wide vision for the apexes, and long for help staying out of trouble. Thankfully all the drivers of our car (Mark, Mark Poole, Richard Abra and less so Timur Sardarov) know this place like the back of their hands. So rather than relying on visual references you are currently driving to the level of grip and taking some strange lines anyway. 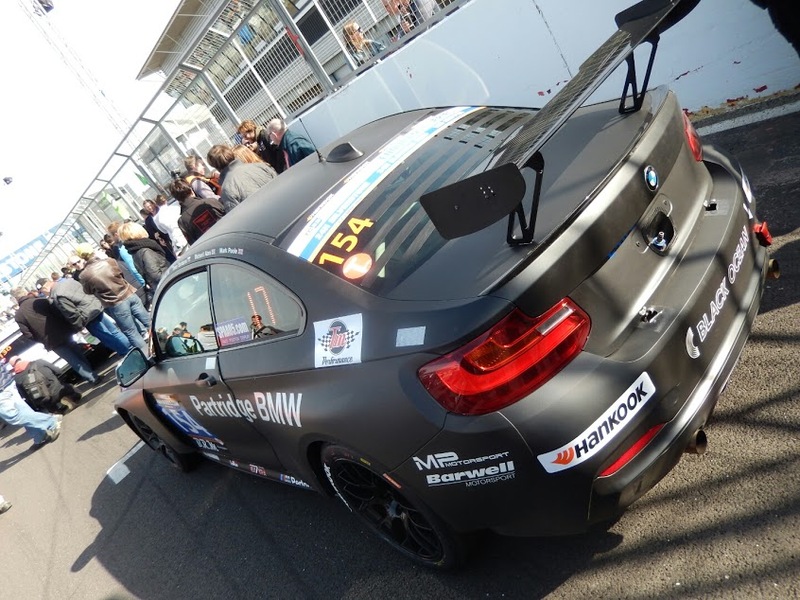 This car the BMW M235 (#154) is particularly good in these conditions. Its is proving to be a bit of a leveller. We are one of the slowest (regulated) cars in the dry, but it is one of the fastest cars in the latest wet stint, I think just Bleekemolen and Martin Short that are quicker. It is a shame then when someone slides up your inside and breaks your steering arm! SCG – I suppose that is motor-racing, and accidents happen ? ML – Yes it is, but when you spend the whole stint avoiding other people’s silly mistakes and someone does something like that which is unavoidable from my side. That is the way it is. The team has done a great job to turn the car around. SCG – Indeed, 20-25-mins stationary, and still a long way to go..
SCG – So Joe not driving today, Team Manager at ‘Barwell’ and the car being in the garage nothing to do with you?! JO – It is lucky when you don’t have a race suit on, it is definitely not your fault! SCG – Richard Abra has taken over the car from Mark Lemmer, how is it? JO – The team did a good job turning the car around. We were leading our class but it is only 2-cars so we were targeting the overall finish, and doing nicely up to 12th, looking fairly strong, but we can’t be very fast (by regulation) and are not very good on fuel (1h20min stints) plus 4-5secs off the quick classes. 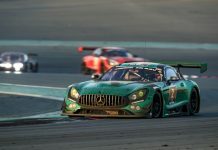 However, when you go back to the other reason we are here is Mike, Richard Abra and Mark Poole haven’t raced in 18-months and we have a big seaason ahead of us in BlancPain, so everyone needs to be race sharp which is why we are here. It is annoying because you always want to do well, but it is not the end of the world. Richard Abra has reported the steering wheel is out of alignment, but the car drives straight, it is handling okay, and the lap times are alright. SCG – So a steady run is now required right? JO – Yes, with a problem this early on, we now need to stay really clean and get really lucky. It is a different 24-hours, its just Touring Cars, so you can go much longer on tyres, and with Creventic there are other factors that make it different to other 24-hours.. The fuelling arrangements, the Code60s, how many can work on the car at one time so it keeps it interesting. 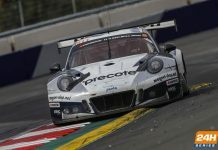 JO – For sure, for what we are here for, it is perfect and it is good fun for me being on the other side (as ‘team manager’), obviously as a driver your always know what is right, and what is best in your opinion. But that is not always the case. Earlier we were one of the first to go to wets, which proved to be right, because when it went Code60 we were already here. Able to get fuel & tyres, and we could get the Pros to bed in the tyres in the worst of the weather. SCG – Thanks Joe & Mark for your time, and good luck to the whole team with the rest of the race.